Do you know what I just realized? I haven't posted a single biscuit recipe. How is that possible? I spent three months of my life eating, sleeping, and thinking about biscuits. Before I started working with Nathalie, I always turned my nose up at biscuits. I honestly wasn't even tempted by the trays stacked high with miniature ham-filled biscuits or the gigantic, fluffy ones at restaurants like Hominy Grill. This was a sort of saving grace for me, as I have extreme difficulty passing on nearly any other baked good. Pound cake? I'm done. Oatmeal raisin cookies? No hope for me. But biscuits? I just found them, well, boring. It didn't help that I am not a devotee of Southern cooking. The collards, fried chicken, baked beans, and banana pudding that make up the core of Southern food really never drew me in. I find their flavors muddled and their heavy, artery-clogging nature utterly unappealing. 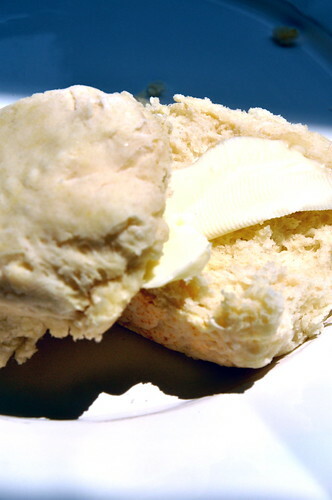 I put biscuits on the back burner in favor of scones. I first fell in love with scones when a second grade classmate brought in a rock-like batch that she had tie-dyed with blue and green food coloring; despite all of their flaws I was hooked. My love affair with scones has lasted since then, but my passion for biscuits didn't start until I tasted these olive oil biscuits early on last summer. Julia, Nathalie, and I had been baking up a storm, testing every combination of flours, fats, and flavors we could think of. I grew to have a sort of indifference toward biscuits, but I didn't love them. One day, Julia, a recent Johnson and Wales graduate who loves healthy cooking as much as I do (hey! I swear I do...it's not always sweets central in my kitchen), suggested substituting olive oil for the butter in our biscuits. They were wonderful. 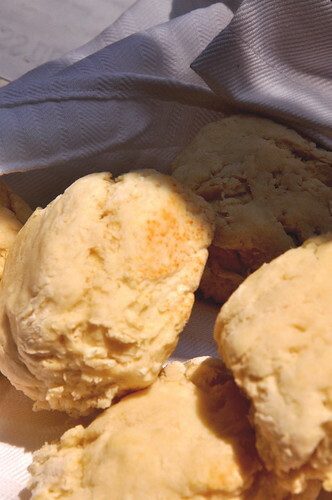 They don't have that characteristic flake that some of you may expect from good Souther biscuits, but their flavor is round and complex. They are quite savory, especially if you gild the lily by brushing a thin layer of salted butter on top, so they're a lovely base for a Mediterranean take on the breakfast sandwich: crisp up some pancetta, fry an egg, slather some pesto on the biscuit, and slice a fresh heirloom tomato and you're good to go. Position the rack on the top shelf of the oven. Preheat the oven to 425 degrees. Whisk self-rising flour in a bowl to ensure no lumps remain. Pour the olive oil into 3/4 cup milk. Make a well in the flour and slowly pour the milk mixture into it. Stir in a figure-8 motion until the dough comes together. Add the remaining milk 1 tablespoon at a time until the dough is shaggy but cohesive. Dust your work surface with all-purpose flour and coat your hands. Fold the dough in half; pat it out into a 1/3- to 1/2-inch-thick round, using a little additional flour only if needed. Fold the dough in half a second time. If the dough is still clumpy, pat and fold a third time. Pat the dough out into a round 1/2-inch thick. Brush off any visible flour from the top. For each biscuit, dip a 2 1/2-inch biscuit cutter into the reserved 1/4 cup of flour; cut out the biscuits, pressing firmly, starting at the outside edge and cutting very close together, being careful not to twist the cutter. Transfer the biscuits to a baking sheet, each butting up against another. 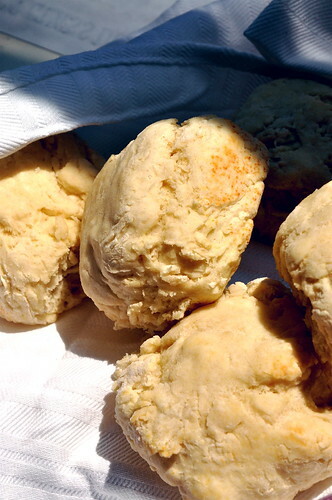 Bake for 10-14 minutes, until the biscuits are a light, honey color. Turn the biscuits out upside-down onto a plate. Turn over and brush with salted butter.